16 Commonwealth is located on the south side of Commonwealth, between Arlington and Berkeley, with 12 Commonwealth to the east and 18 Commonwealth to the west. 16 Commonwealth was built ca. 1864 as the home of Charles Woodbury and his wife, Relief (Ball) Woodbury. They previously had lived at 91 Pinckney. Charles Woodbury purchased the land on which 16 Commonwealth was built from real estate dealers Henry Whitwell and Samuel Horatio Whitwell in two transactions, the first on June 23, 1862, with a frontage of 20 feet on Commonwealth and the second on June 19, 1863, with a frontage of 19 feet immediately to the east of the first lot. Both lots were part of a larger parcel of land Henry Whitwell had purchased from the Commonwealth of Massachusetts on May 2, 1860. Charles Woodbury reconfigured the lots so that the lot to the east, where 16 Commonwealth would be built, would be 20 feet in width, and sold the lot to the west, with a 19 foot frontage, to Lydia (Gray) Ward, the widow of Thomas Wren Ward. Click here for an index to the deeds for 16 Commonwealth. Charles Woodbury was a partner in Standish & Woodbury, masons and builders, who built a number of houses in the Back Bay and may have built 16 Commonwealth. 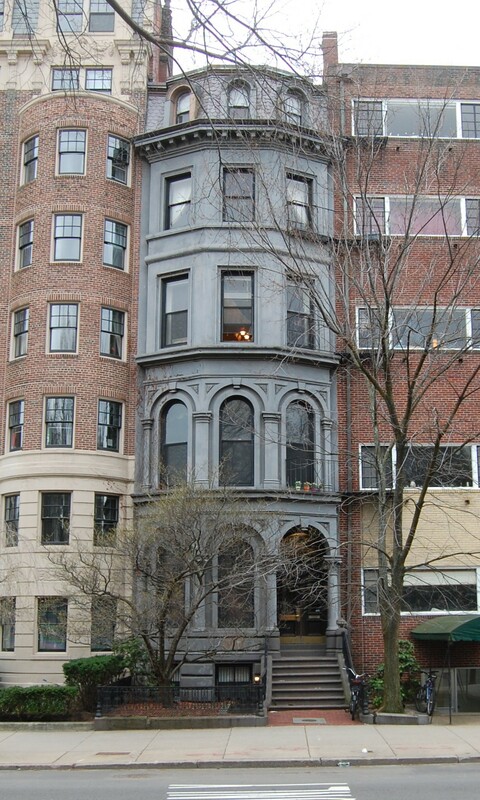 He and his partner, Lemuel Miles Standish, had built 20-36 Beacon in 1860-1861, and Lemuel Standish and his wife, Olive L. (Nutter) Standish, lived at 32 Commonwealth. 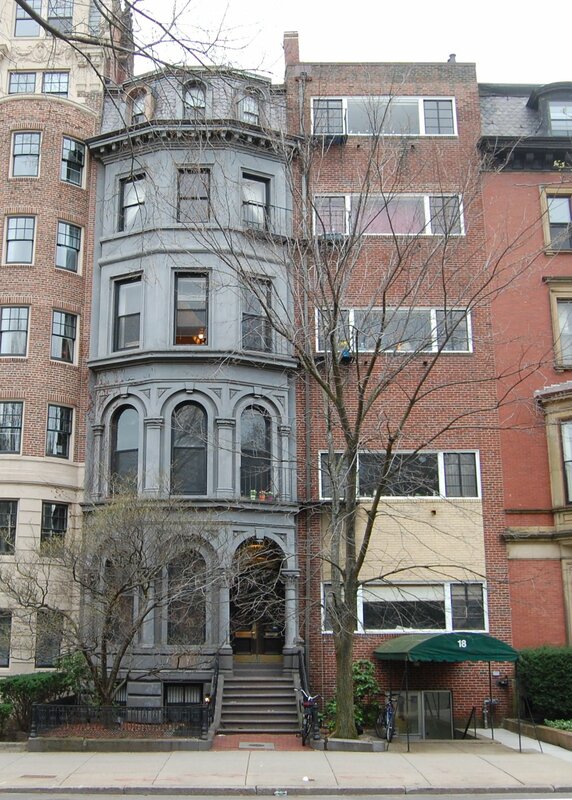 Charles Woodbury’s nephew, Isaac Franklin Woodbury, was a partner in another contracting firm, Woodbury & Leighton, which also built numerous houses in the Back Bay. Relief Woodbury died in October of 1879. Charles Woodbury continued to live at 16 Commonwealth. By the 1890-1891 winter season, he had been joined by his son-in-law and daughter, Albert Rufus Whittier and Caroline (Carrie) Amelia (Woodbury) Whittier. They previously had lived in Hyde Park. Albert Whittier was a real estate and mortgage dealer. Charles Woodbury died in June of 1891. 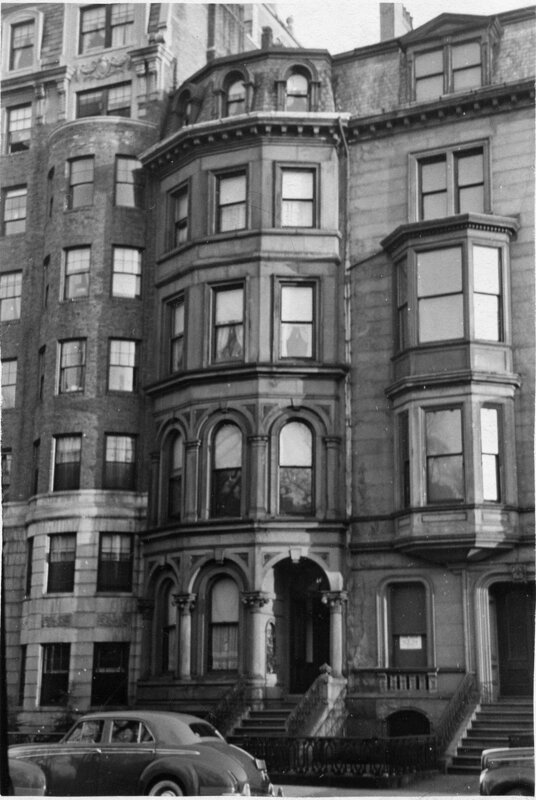 Albert and Caroline Whittier continued to live at 16 Commonwealth, and on May 24, 1894, acquired the property from Charles Woodbury’s estate. They also continued to maintain a home in Hyde Park. Carrie Whittier died in January of 1895. Albert Whittier remarried in October of 1900 to Louise Baldwin Thompson, and they continued to live at 16 Commonwealth and maintain a home in Hyde Park. Albert Whittier died in August of 1922. Louise Whittier continued to live at 16 Commonwealth and, in June of 1927, married again, to William Jaffray de Hauteville Bell. After a seven-month honeymoon tour around the world, they lived at 16 Commonwealth until about 1929. By 1930, they had moved to Hyde Park. Louise Bell continued to own 16 Commonwealth and lease it to others. 16 Commonwealth was not listed in the 1930-1937 Blue Books and was shown as vacant in the 1932-1934 City Directories. By 1934, 16 Commonwealth was the home of Paul Vincent Donovan, principal of a continuation school on Warrenton Street, and his sister, Mary Alice (called Alice) (Donovan) Mann, the widow of Irving N. Mann. They previously had lived in an apartment at 277 Beacon. 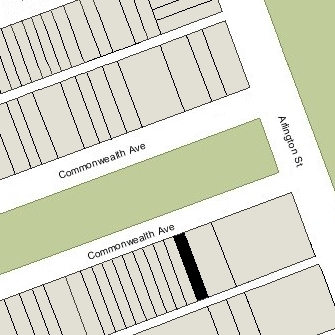 They continued to live at 16 Commonwealth in 1939, but had moved to an apartment at 90 Commonwealth in 1940. In 1940, 16 Commonwealth was once again briefly the home of Louise de Hauteville Bell (William Jaffray de Hauteville Bell had died in July of 1934 and she had continued to live in Hyde Park until about 1939). She moved by 1941. On November 14, 1940, 16 Commonwealth was acquired from Louise de Hauteville Bell by Mrs. Louise B. Donahue, a widow. On March 14, 1941, 16 Commonwealth was acquired from Louise Donahue by Mabel Anne (Cowie) Adams Doyle, the widow of Dr. William Gray Adams, a physician, and former wife of Henry Lawrence Doyle. She used the surname Adams even though she had been married a second time to Henry Doyle. She previously had lived and operated a lodging house at 20 Marlborough. In August of 1943, she filed to convert 16 Commonwealth into a lodging house. Her application was denied because of inadequate means of egress and insufficient light and ventilation in the bathrooms. Notwithstanding her plea, the petition was denied. In February of 1947, she filed for (and received) permission to make a number of internal renovations to improve fire safety and egress issues. In the permit, she indicated that the building was being used as a lodging house. She continued to live at 16 Commonwealth until her death in 1949. 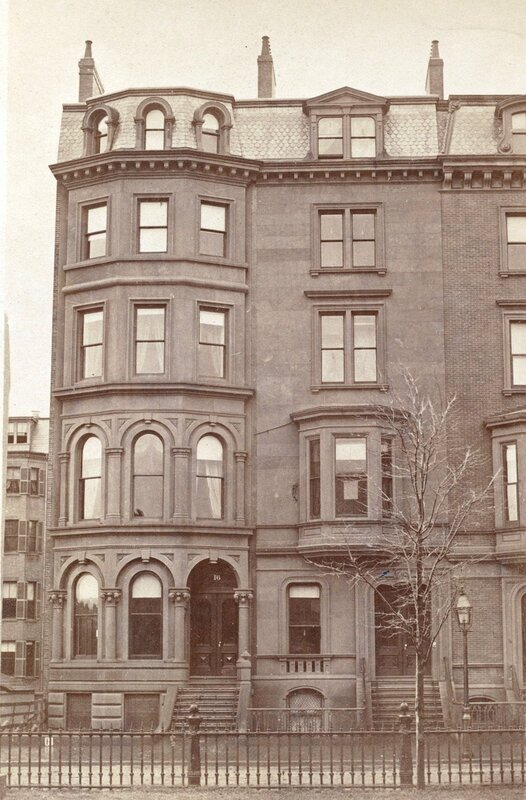 16 Commonwealth was inherited from the estate of Mabel Adams by Mrs. Minnie (Light) Simmons, the former wife of George L. Simmons, who lived at 16 Commonwealth and continued to operate it as a lodging house. She married again, in about 1964, to John M. Spector, a bakery salesman, and they moved to Brighton. On August 20, 1964, 16 Commonwealth was acquired from Minnie Simmons Spector by Chamberlayne School and Chamberlayne Junior College, which used the building as a dormitory. Chamberlayne went bankrupt in the mid-1970s and sold many of its properties. On June 6, 1974, 16 Commonwealth was purchased by Thomas J. Dokton. In July of 1974, he applied for (and subsequently received) permission to convert the property into twelve apartments. On September 16, 1982, 16 Commonwealth was purchased from Thomas Dokton by Mary Elizabeth Brady, trustee of the 16 Commonwealth Avenue Trust. The property was damaged by fire sometime in 1982, and in December of 1982, Mary Elizabeth Brady filed for (and subsequently received) permission to make repairs to the roof and the top two floors. The property remained twelve units. On May 30, 1984, she converted 16 Commonwealth into the Whitwell House Condominiums. The condominium master deed indicted that the property was being converted into eight units; however, it remained twelve units and on July 25, 1988, she filed an amendment to the master deed increasing the number of condominium units to twelve.